Mike is our optical manager. He has been with Advanced Eye Care Services since it opened in 1999. Before that, Mike served in the Navy and has been an optician since 1984. 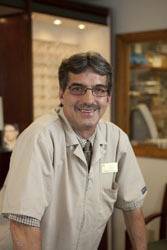 Not only can he pick out the perfect pair of glasses for all of your vision needs, but he is also an expert at adjusting and repairing frames. Mike lives in Lewistown with his wife, Kim, and their grandchildren, Breanna, Cayden and Conner.